While Papa John used his ample means to find his beloved and long lost Camaro Z28, a much less well-to-do man found his pride and joy after an incredibly lucky session on eBay. 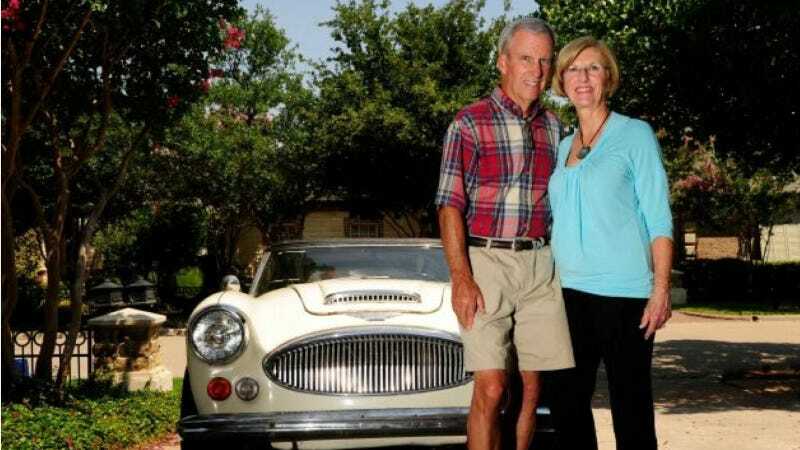 Bob Russell of Dallas, TX was just reunited with his 1967 Austin Healey 3000 after it was stolen 42 years earlier, according to the Associated Press. Russell's Healey was taken from his Philly area apartment after his second date with the woman that would eventually become his wife. After that, Russell left the car for dead. He thought the ride he paid $3,000 for in 1968 was probably parted out, wrecked, or like many British cars, had succumbed to various leaks and electrical issues. But he never gave up hope. Russell checked eBay religiously to find the car and boy did he get lucky this May. He found his exact car for sale in California at the Beverly Hills Car Club. Then he got even luckier. The car didn't meet the auction's reserve price and Russell still had the original keys along with signed affidavits from friends and the original owner that he never sold the car. He just didn't have the police reports. Thankfully, Philadelphia and Los Angeles Police stepped up to the plate and reopened the case. The police impounded the stolen Healey and Russell just had to pay about $1,500 in impound and transport fees to get the car back. That's way better than the $24,000 price the dealer offered Russell for the car. Now that he has it back, he wants to restore it. We imagine he'll also be parking it somewhere unbelievably safe.